If you are planning to redesign your kitchen or are looking to replace your old hob so that it’s a better match to your built-in oven, our built-in hobs buying guide will give you the most useful information you need to help you make the best choice to suit your everyday needs. Deciding on which type of hob you would like for your kitchen is one of the first things you need to consider when buying a new hob. Our range of built-in hobs offers 4 different types for you to choose from, split between gas or electric. Read on to find out which type of hob is the best for you and your everyday cooking needs. Being an electric hob, an induction hob can easily be placed on most work surfaces, as long as an electric power source exists. 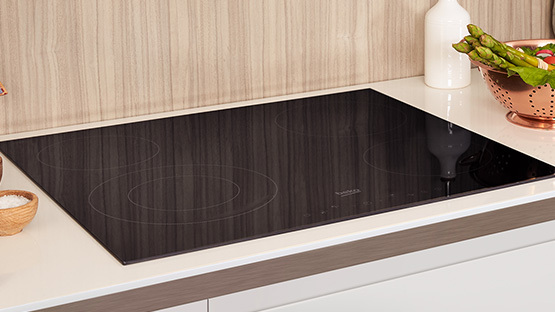 If you’re someone who looks for high efficiency and energy saving qualities in your kitchen appliances, then a Beko induction hob would be perfect for you. You can find out more about our induction technology in the Extra Features section. What’s more, our range of built-in induction hobs adds a modern and stylish touch to your kitchen, fitting seamlessly in with your kitchen’s design. 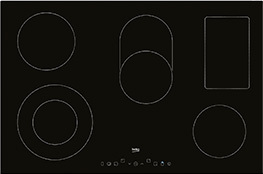 Moving a step up from our basic electric hob model is our range of ceramic built-in hobs. Being electric, they can easily be placed anywhere you prefer in your kitchen as long as there is an electric power source. This type of hob is great for those who prefer excellent cooking results and are also after a sleek and stylish finish to be added to their kitchen. Our range of ceramic hobs offers models that come with easy to use dials as well as touch-control models, making them incredibly quick and simple. 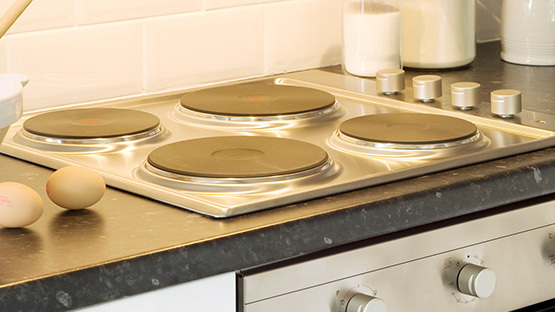 For more of an authentic cooking experience, our range of built-in gas hobs is ideal. 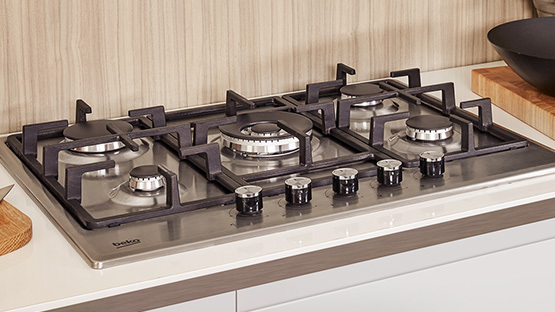 The only thing to keep in mind when designing your kitchen is where your gas lines are in your kitchen – this will play a role in where you would be able to place your gas hob. 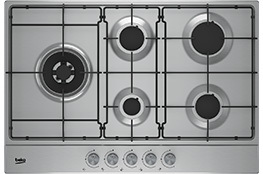 Our range of gas hobs offers easy-to-use dials helping you control the heat levels of the cooking zones with precision. Offering models with cast iron pan supports, auto-ignition as well as high power wok burners, our range of built-in gas hobs comes with the features you need to help you every day. If you’re after perfect cooking performance but are on a budget, consider our range of solid plate built-in hobs. Being electric, our range of solid plate hobs can be placed anywhere you like in your kitchen, provided the right electric power sources are available. 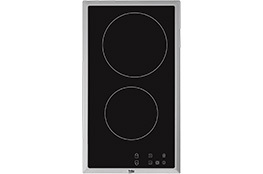 This basic electric hob type is very easy to use as well as easy to clean and is a great value for money option too. Now that you’ve decided on the type of hob which would best suit your everyday cooking needs, it’s time to give some thought to its size. When it comes to built-in hobs, the most important dimension to consider is the width. When space is at a premium in your kitchen, our 30cm built-in ceramic hob is ideal with its two different sized burners. Being touch control, it’s incredibly easy to use too. Fitting into most kitchens seamlessly is the most common hob width: 60cm. 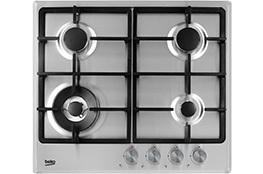 Coming with 4 burners, a 60cm built-in hob is perfect for most everyday cooking needs. Offering extra space for large pots and pans, our 75cm built-in gas hob is ideal and great for those who love to cook more in one go. For those who love cooking many dishes at once while preferring a modern look to their kitchen, our 80cm built-in ceramic hob is the most suitable. Our electric hobs with induction technology use electromagnetic waves to heat your induction friendly pan containing iron, to only heat the area of the pan which is in contact with the hob surface. 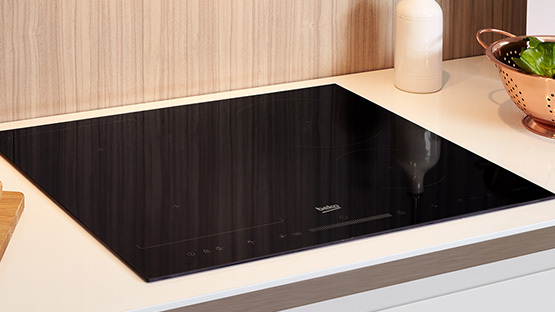 By transferring heat to only the part of the cooking zone where the heat is needed, our built-in induction hobs offer quick, safe and energy efficient cooking. Our built-in gas hobs come with highly efficient burners which direct the heat at a more precise angle, allowing for more heat to be transferred to your pan. 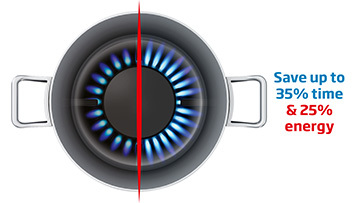 Heat is quickly and evenly distributed across the bottom of your pan to help you achieve excellent cooking results while using up less of your gas, helping you save money on your energy bills. We know that spillages on a hob can be difficult to clean up. 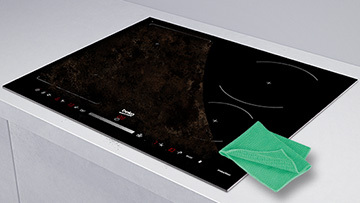 So, we’ve added a specially designed glass to our induction and ceramic hobs which offers a flat and smooth surface, giving you the easiest of cleaning experiences. Now that you have all the information you need to purchase the best hob for you, why not browse our range of built-in hobs? Or if you’ve already decided on the hob you would like, have you considered which kind of oven would best suit your needs? Find out more about our built-in ovens here.